Amazon has made the Prime Video streaming service available worldwide, following the global launch of Netflix in January 2016. As of 14 December 2016, Amazon Prime Video was available in 200 countries, excluding China, Syria, Iran, and North Korea. In total, the launch encompasses 242 distinct geographical territories. IHS analysts Irina Kornilova and Dan Cryan offer insights. The expansion marks the arrival of the Prime video offer in any form for Amazon customers in Mexico and the Netherlands, while Amazon has been operating a limited version of Prime which offers delivery and cloud storage, in Belgium, Canada, France, India, Italy and Spain. These existing Prime subscribers can now receive Amazon Prime Video as part of the Prime membership offer, at no additional cost. The remaining territories now have the service available for standalone subscription for either $5.99 or €5.99 ($6.37) per month, depending on the geographic region. The first six months of subscription are discounted to $2.99 and €2.99 ($3.18) respectively. A free trial for new customers is limited to seven days. Similar to Netflix’s move, Amazon’s global rollout has launched without a localisation process, with limited library consisting mostly of Amazon’s original programming, few international languages, and blanket pricing in dollars and euros. Services without localisation have struggled to achieve the same level of success as more territory-specific offerings; Netflix, that will see a full year of Global operations in January 2017, is a prime example of this. IHS Markit expects new territories where Netflix has launched in January 2016 to account for fewer than 5% of total number of subscribers by the end of 2016. Netflix had over 50 countries and territories launched between 2011 and 2015 before its global rollout to remaining 130 territories in January 2016. At the time of the global launch, Amazon Prime Video has only been available in Austria, Germany, the UK, the US and Japan. Content. Amazon Prime Video is launching with a limited selection of original content, including the widely promoted new automotive entertainment show The Grand Tour. More content, including some of the original programming will be added to the service through 2017. IHS Markit TV Programming Intelligence services analysis indicated that last year, Amazon significantly increased its investment in original content – an estimated $337 million from $176 million in 2015. However, Amazon lags well behind, Netflix, which IHS Markit estimates will have spent $1.2 billion on original programming in 2016. Amazon Prime Video is available in English, with French, Italian, Portuguese and Spanish subtitled and dubbed versions available for some titles. Netflix supports 21 languages to date. Pricing. 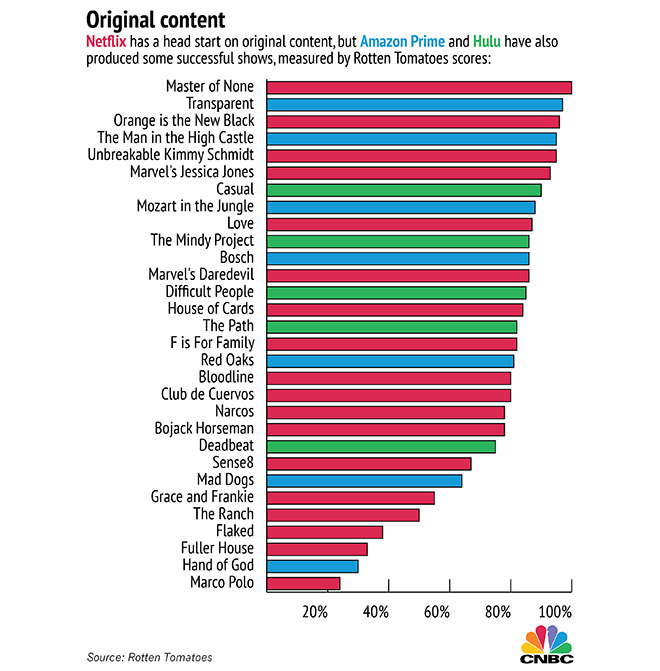 Amazon Prime Video’s low launch price serves to plant the perception of value proposition in potential customers, and to compensate for limited content proposition. Amazon is seeking to avoid the backlash from customers that Netflix experienced in territories where the service launched at a full, non-localised price that was deemed too expensive for the amount of content available. Amazon Prime Video, even at full price, remains cheaper than Netflix: $5.99 (or €5.99) vs. $/€7.99 for Netflix’s basic tier subscription. With the global launch of the video service, Amazon is inverting a go-to-market strategy for Prime. Leading with video allows Amazon to establish a brand associated with value, on which can be then built an ecommerce business at a later date. Importantly, while the go-to-market might have changed, the core purpose of Prime remains unchanged: long term Prime Video’s international roll out is positioned to drive ecommerce sales. This is reminiscent of Amazon’s initial launch which built out from entertainment (in that case books, and later DVDs) eventually becoming the “everything store”. 2017 subscriber forecasts: Europe: 5.3m; USA: 23.6m; Asia Pacific: 1.6m. The global launch of Amazon Prime Video will see active users of the service increase to 64 million worldwide by the end of the 2020. Amazon Prime Video subscriber and revenue forecasts by country to 2020 are now available through IHS Markit’s Broadband Media Intelligence Trax service. Contact details.